In Windows 10, the files are opened with the wrong program, why this? If in Windows 10 files or folders are opened with the wrong program, app, or application, change the settings! In this FAQ, you will learn how to assign individual files to a specific program and tips for, how to find the location or directory of the particular program. The examples Images here, have been created under Windows 10, but it can also be used as a solution for Windows Server 2016 and other MS OS! 1.) ... Open the file assignment in Win-10! 2.) ... Select another app or program! 3.) ... Other possibilities of file allocation under Windows 10! See also: open a program location in Windows-10 (path, folder)? 1.) Open the file assignment in Win-10! Please start the Windows 10 File Explorer with the key combination [Windows-Logo] + [E] and mark the corresponding file. Right-click to open the context menu! 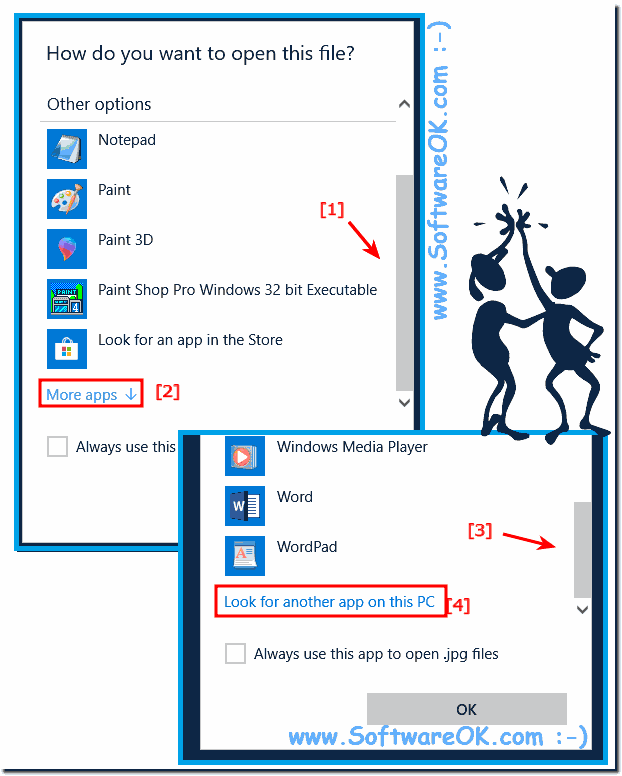 Select ► Open with ► "Select other app"
(Image-1) In Windows 10, Open files with another program! 2.) Select another app or program! 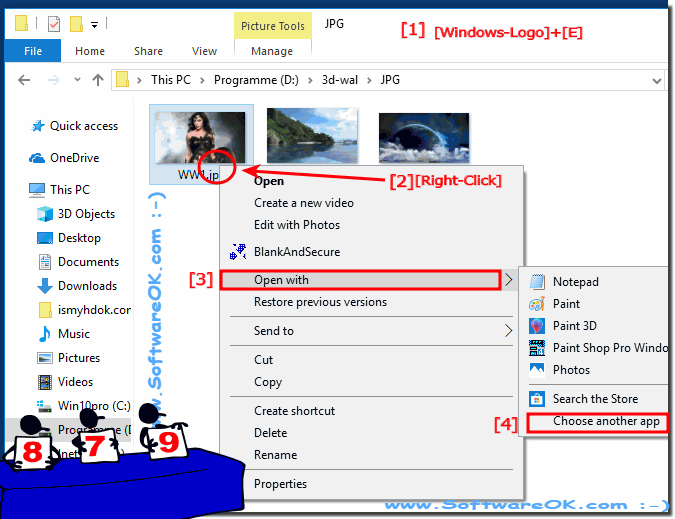 If you have the file assignment open in Windows 10, it is quite easy to assign other programs to open the file type. 5. Then the dialog opens to assign the program path. This can help you: Open the location of a program in Windows-10 (path, folder) to find the location / path of a program! (Image-2) Assign file extension program under Windows 10! 3.) Other ways of file allocation under Windows 10! ► File associations set Windows 10, but how? You can easily use this example / solution for Windows 10 Home, Pro, Enterprise and even Server 2016. Whether it's a Windows desktop, tablet, Surface Pro / Go, or even a server operating system. It has been tested on all and successfully verified. It is sometimes necessary to use this simple and effective way, to get in touch with the benefits of Windows 10 OS. Windows-10 - FAQ-241: In Windows 10, the files are opened with the wrong program, why this? Security and Maintenance Change settings under Windows 10? Setting for file associations in Windows 10, but how? After upgrading from Windows 8.1 to 10 on the notebook again and again driver problems!